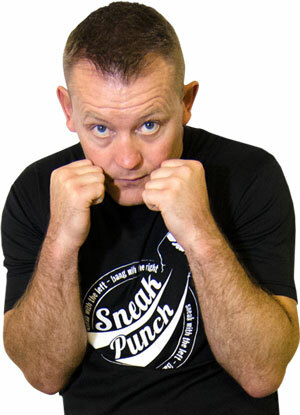 "I will put you through your paces with proper 'old school' boxing training"
First things first – I’m not a TV presenter and these boxing workouts weren’t filmed in a glossy studio with models brought in for the day. I am a former professional boxer and all the boxing workouts were filmed in a real boxing gym with real people that I have taught to box. When I launched the first series of boxing training videos on YouTube, my aim was to bring the boxing gym experience directly to you … whether it be in your home, garage or gym. I wanted to pass-on everything I’ve learned during my 30+ years in the world of boxing – both as a professional boxer and a boxing coach. The Fight Yourself Fit boxing training system was developed after working with 100’s of my boxing training students over many years. My students span a wide spectrum of fitness levels, boxing abilities, ages, weights, body shapes, and personal fitness goals. We are all unique, but many of us have the same common goal – we want an achievable training program that motivates and teaches us. As your coach my first pledge was to design a boxing training system that would motivate and push you – further than you ever knew you could go. There’s no sugar coating here – this isn’t a boxing ‘aerobics class’ – these are real boxing techniques and boxing fitness training. I will put you through your paces with proper ‘old school boxing training’. I guarantee that you will learn more in half an hour with me than you would attending dozens of boxing classes. Secondly, and most crucially, I’ll also be coaching you on different boxing techniques and combinations, always keeping you fresh and ready to learn. We’ll go through each boxing workout together in real-time – I’ll demonstrate each technique, combination or exercise within each round – giving tips and pointers as you progress. If you’re a boxing beginner or a student who likes to analyse new techniques you can benefit from our Boxing Technique ‘Help Video’. This is an extra 20-minute video that we’ve included with the ‘Fight Yourself Fit’ programme – allowing you to study boxing skills at your own pace in preparation for the workouts. If you missed it yesterday – I urge you to read John’s post about his boxing training journey using Fight Yourself Fit. John was a complete beginner and his experiences with this system prove beyond doubt that boxing training is for everyone. If you’ve learnt something or think Fight Yourself Fit could help someone you know – Share it!